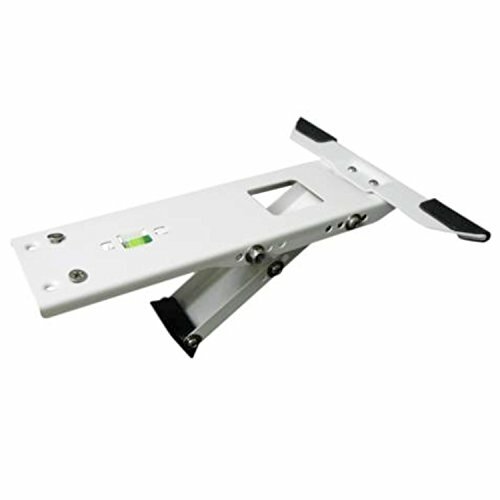 The AnyMount universal window air conditioner support bracket is easy to install for units up to 88 lbs. It can easily be assembled and placed in the window to support your window air conditioner from 5,000 to 10,000 BTU in size. Window Requirements: Window sill must be a minimum of 2 inches deep. Window sill must be able to accept (3) 3.5 inch long screws. Window stool cannot exceed 1.5 inches. Cannot be used with slide casement or casement windows. DESIGNED FOR EASY SETUP - Easily install from inside the comfort of your home in minutes. Safe, durable and convenient. UNIVERSAL design works with most window units 5,000 to 10,000 BTU in size and supports up to 88 lbs. (check description below for window requirements). All weather stainless steel construction. BONUS - Exclusive precision bubble level assures proper mounting angle. WINDOW REQUIREMENTS - Mounts on any surface up to 10.4 in from the wall and 4.5 in - 6.6 in adjustable height. EVERYTHING INCLUDED - All necessary hardware included. If you have any questions about this product by AnyMount, contact us by completing and submitting the form below. If you are looking for a specif part number, please include it with your message.